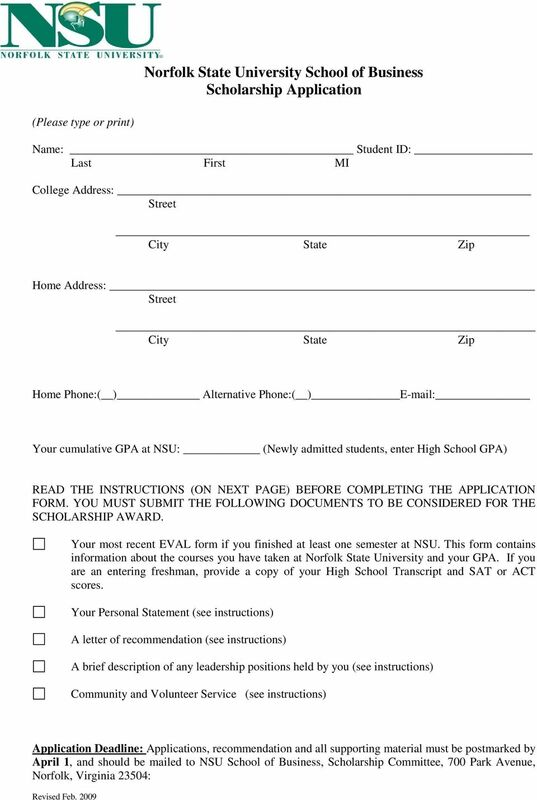 Download "Norfolk State University School of Business Scholarship Application"
2 INSTRUCTIONS FOR COMPLETING THE SCHOLARSHIP APPLICATION FORM Scholarships awarded by Norfolk State University School of Business are restricted to undergraduate students who are currently enrolled in the Business School and have pre-registered or newly admitted students who wish to join NSU Business School as full-time students. Recipients must have the required cumulative grade point average, be in good standing, and must maintain full-time status with a minimum course load of 12 credit hours per semester as of the final drop date in the semester. (Scholarship award will be cancelled, if a student does not join the NSU Business School or does not register for the full-time load of 12 credit hours). Scholarships are awarded on the basis of (competitive) merit and demonstrated financial need. Applicants must file the current FAFSA with the U.S. Department of Education. In order to evaluate scholarship applications, the School of Business Scholarship Committee will retrieve academic information from the registrar and financial need information from student financial services. This information is confidential and will not be shared with anyone except the School of Business Scholarship Committee. Have you filed a FAFSA with the U.S. Department of Education? If not, do so immediately. Also, pre-register for classes at NSU. 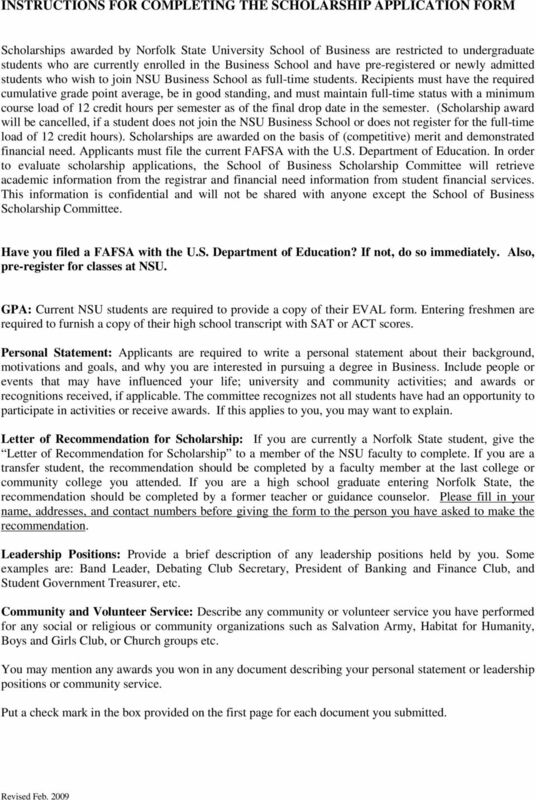 GPA: Current NSU students are required to provide a copy of their EVAL form. Entering freshmen are required to furnish a copy of their high school transcript with SAT or ACT scores. 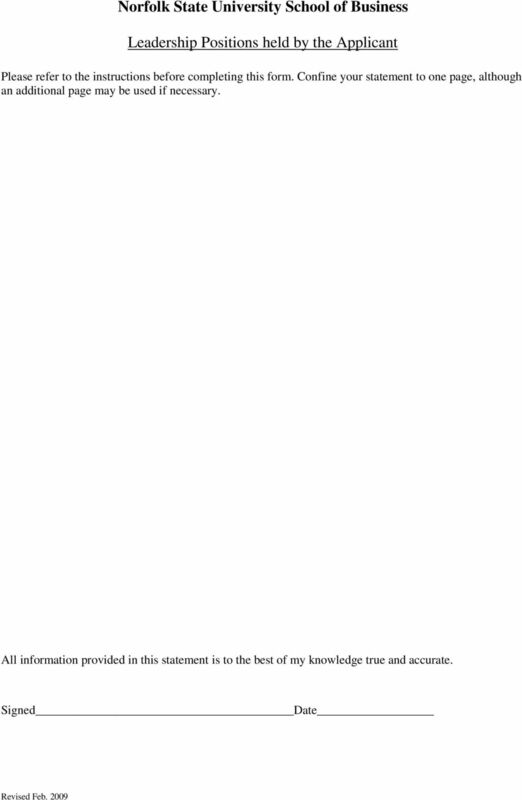 Personal Statement: Applicants are required to write a personal statement about their background, motivations and goals, and why you are interested in pursuing a degree in Business. Include people or events that may have influenced your life; university and community activities; and awards or recognitions received, if applicable. The committee recognizes not all students have had an opportunity to participate in activities or receive awards. If this applies to you, you may want to explain. Letter of Recommendation for Scholarship: If you are currently a Norfolk State student, give the Letter of Recommendation for Scholarship to a member of the NSU faculty to complete. If you are a transfer student, the recommendation should be completed by a faculty member at the last college or community college you attended. If you are a high school graduate entering Norfolk State, the recommendation should be completed by a former teacher or guidance counselor. Please fill in your name, addresses, and contact numbers before giving the form to the person you have asked to make the recommendation. Leadership Positions: Provide a brief description of any leadership positions held by you. Some examples are: Band Leader, Debating Club Secretary, President of Banking and Finance Club, and Student Government Treasurer, etc. Community and Volunteer Service: Describe any community or volunteer service you have performed for any social or religious or community organizations such as Salvation Army, Habitat for Humanity, Boys and Girls Club, or Church groups etc. You may mention any awards you won in any document describing your personal statement or leadership positions or community service. 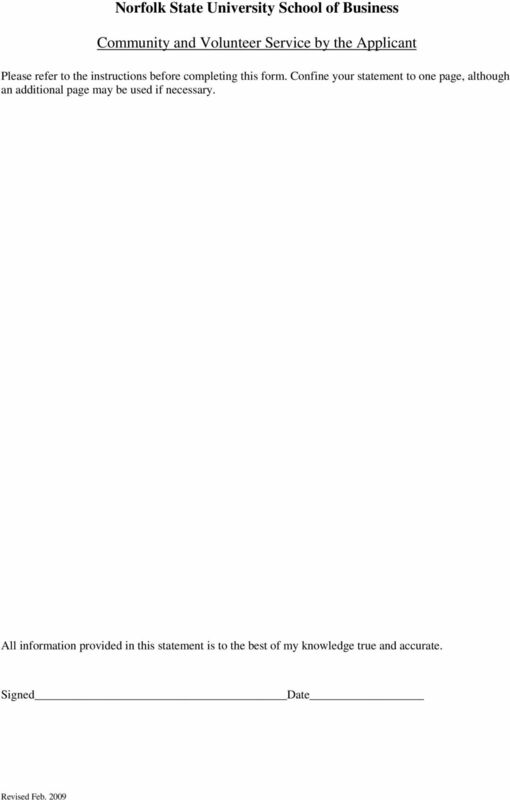 Put a check mark in the box provided on the first page for each document you submitted. 4 Scholarship Recommendation Student s Name SSN College Address Street City State Zip The above named student has applied for a scholarship to Norfolk State University School of Business. 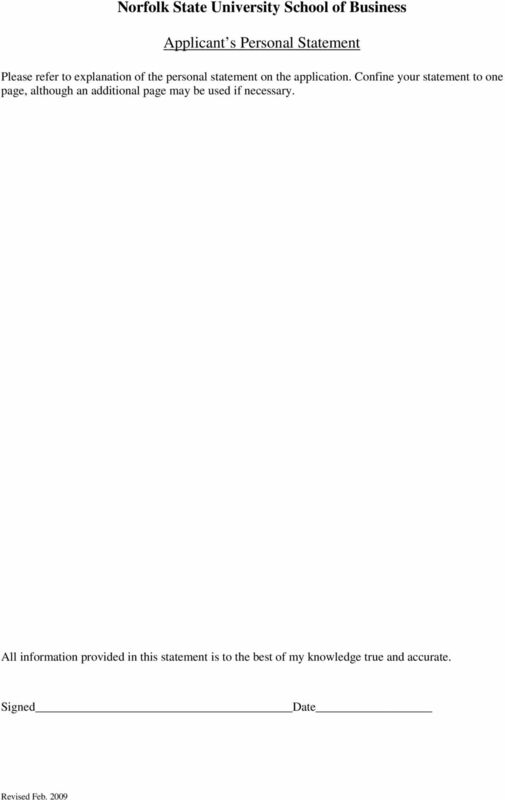 In the space below, please provide any information that might assist the scholarship committee in evaluating the applicant. Information provided is confidential and will not be shared with anyone other than the School of Business Scholarship Committee. 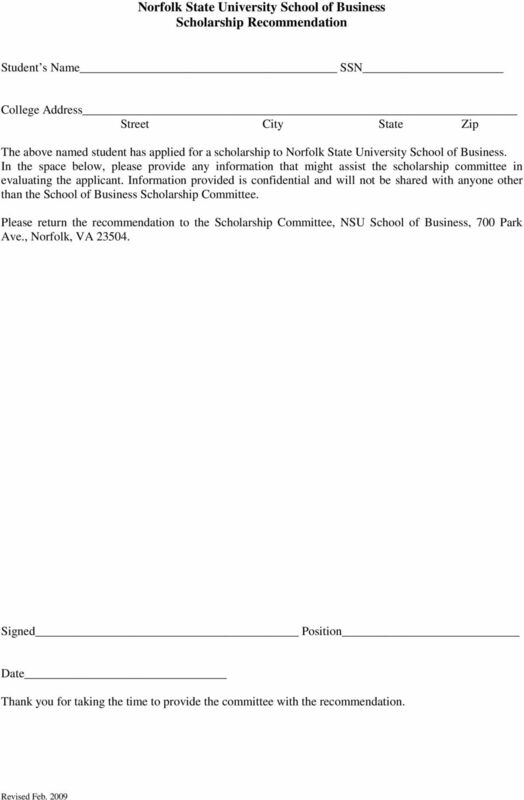 Please return the recommendation to the Scholarship Committee, NSU School of Business, 700 Park Ave., Norfolk, VA Signed Position Date Thank you for taking the time to provide the committee with the recommendation. Scroll down for more information and applications for each scholarship.